WATERBURY, CT - Shortly after noon on February 18, 2015, the Waterbury Fire Department was dispatched to 990 Meriden Road for a commercial building fire. First units on scene found heavy fire at A-1 Storage. This complex is a storage facility that encompasses 5 buildings. The largest of the 5 was the one involved in fire. Operations quickly went defensive due to concerns of propane tanks and ammunition. The fire escalated to a 2nd alarm and 118 units were destroyed. 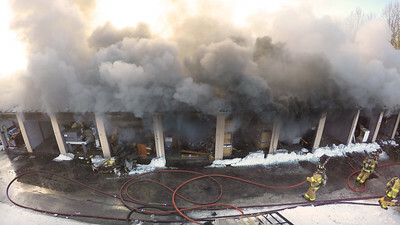 The drone that provided the footage and photos of this fire was also utilized by incident command to check on the changing conditions of the roof and roof-top units.